While Gladney has offices throughout the US, Domestic Infant Orientation occurs at the Fort Worth Campus. Families from all over the U.S. attend this invitation-only event to learn more about Gladney and about the Domestic Infant Adoption Program. John and Karen traveled to Fort Worth from a small Texas town to see what Gladney could offer their family. At this point in our story, I can’t imagine where we would be without Gladney. John and I made the decision to pursue adoption about a year before Gladney entered our lives. We explored agencies that were more “local” to us, but we never left feeling like we belonged there. We were introduced to Gladney through a cousin and decided to attend orientation. It was at orientation that our lives were forever changed. We live in a very rural area of Texas. When everyone in the room stood up to say where they were from, we were not surprised to find no one else in the room could identify our little town. We were shocked to find a lot of the other couples were from all over the United States. We knew this was a testament to Gladney. Once introductions were over, Gladney’s attorney who had spoken to our group rushed over to tell us she knew our little town very well and had grown up only 10 miles away. We began to feel like this was where we were supposed to be. What truly drew us to Gladney was their love for and attention to all birth mothers. This was something that was extremely important to us. I truly believe no other agency can compare to Gladney in this area. We waited for our Thomas for 13 months. He is the sweetest, most fun, and cuddly little boy there is!! He loves babies, swinging, and climbing on anything! He enjoys pointing at everything and babbles endlessly with animated facial expressions to match. 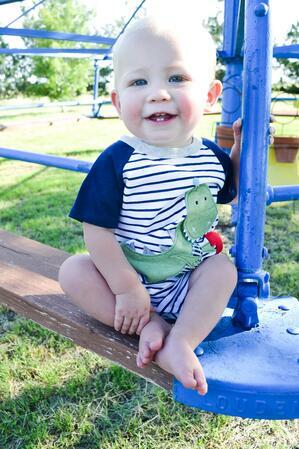 He is the light of our lives, and we will forever be grateful to his birth family and loyal to the Gladney Family. If you’d like more details on attending an Orientation, request a free Information Packet.